It’s a common question, but an unexpected group of friends gave it a new meaning. 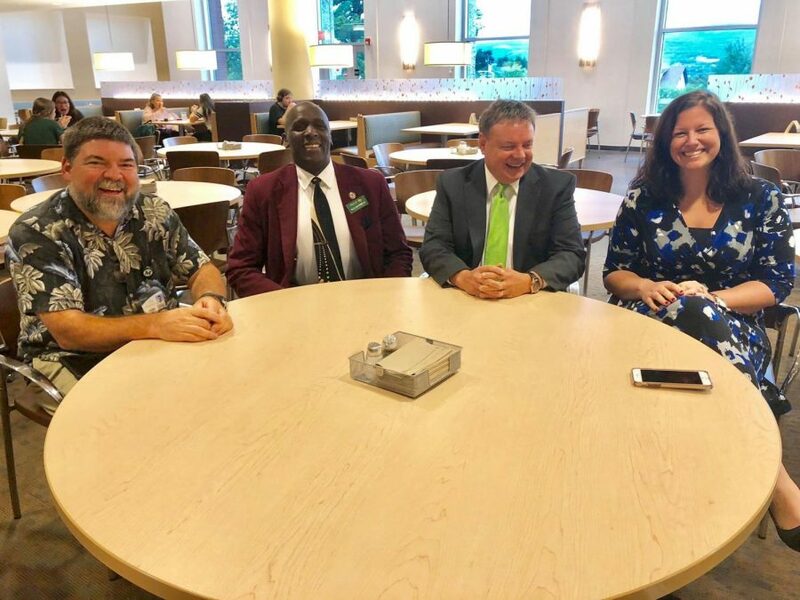 For Director of Human Resources Dr. E. Lee Felder Jr., Alumni Engagement Director Cara Green, Director of Information Technology (IT) Tom Steffes and Marketing Director Jim Brown, lunch means friendship. Brown explained how the “Lunch Bunch” got its start in mid-December of 2017. And so, the Lunch Bunch was born. At their weekly meetings, the Lunch Bunch speaks on a variety of things happening either on campus, within their departments or their home lives. From connecting with co-workers to discussing where the best deal for grocery shopping is, the Lunch Bunch covers it all. However, with any new job, there comes some sort of difficulty. Unlike Felder, who said he had an “easy transition to Marywood,” Steffes and Brown both had their fair share of challenges coming to campus. Struggle doesn’t have to last forever, though. Green, labeling herself as an “extroverted introvert,” said that if someone is struggling to find his or her place in the world, whether it be in school clubs, organizations or new jobs, it is important to reach out to those around the area. According to Felder, people should try different things to get out of their comfort zones. He said it’s important for people to reach out to organizations they may not think they will like because they never know who or what they could find. Remembering a time when he was new to Marywood, Steffes said that it never hurts to be a friend to someone who feels alone. The Lunch Bunch encourages any new faculty members to join them for lunch on Wednesdays at noon in the Nazareth Dining Hall.